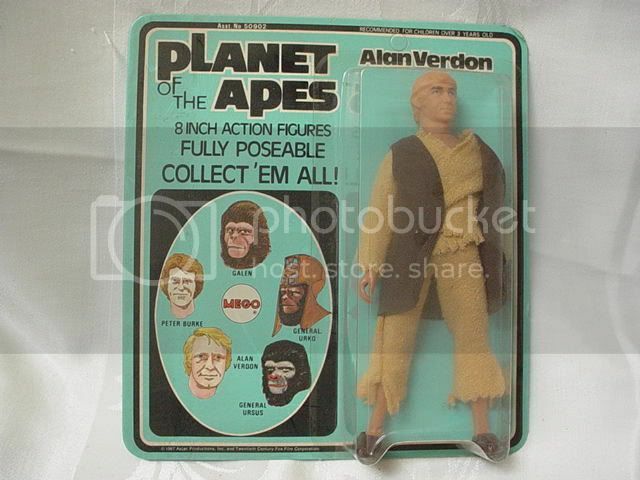 Description: ESW presents, from a fine San Diego estate, this MEGO 1967 PLANET OF APES Action Figure ALAN VERDON. 8" figure. See photos below for item condition and details. Never removed from card. PLEASE SEE MY OTHER AUCTIONS FOR MORE VINTAGE TOYS, BOBBLEHEADS, ACTIONS FIGURES, DOLLS AND MORE FROM THIS SAME ESTATE. I WILL COMBINE SHIPPING TO SAVE YOU MONEY. OFFERED WITH NO RESERVE STARTING AT JUST $1.00. Satisfaction is Guaranteed. Any questions please email. Shipping will be just $9.50 via UPS insured or USPS Priority Mail with Delivery Confirmation included. International buyers will reasonable estimated shipping based destination. I do not end auctions early for a quick sale. Thanks. Up for your purchasing pleasure we have a very rare vintage MEGO, Planet of the Apes General Urko. 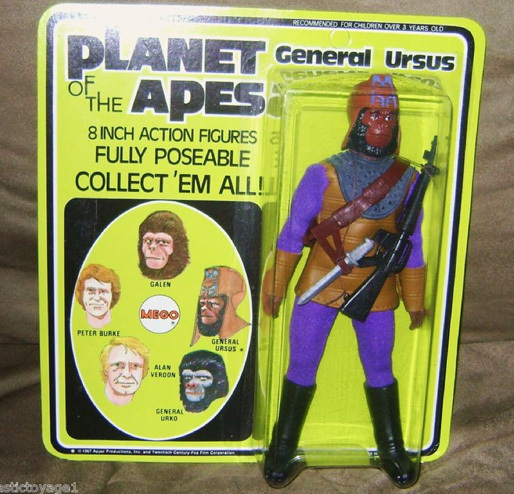 This General Urko comes from the 1974 release of the Planet of the Apes line. General Urko is un-punched and is on the Green Card which is labeled with General Ursus name. The card is in very good condition, the front is very clean and in excellent condition there is only a small crease in the upper right corner of the card. The bubble is in quite good condition but does exhibit some dents at the top of the bubble it also does have a crack in the bubble from with seems to be attributed the helmet. The back is in fantastic condition and has a little to no shelf wear. The toy comes from a personal collection that was kept in a very clean, pet, and smoke free environment. Other than the mentioned very minor flaws this collector’s item is in very good condition. Planet Of The Apes Forbidden Zone Trap Play Set made by Mego.This play set is in played with condition but was took care of. The tabs where you put it together all show wear from putting it together and taking it apart. The rest of it is in good condition. The Trap still works as it should. All 4 little brown plastic tabs that hold it together are all here. The playset comes with its original instructions and comes in its original box. This was someones Christmas present in 1975. The bad, the play set is missing one shudder that goes on the upstairs window. Look at the picture, there is only one. One hinge on the trap door is broken, the broken piece is included, it is very small and not very noticeable. Look at the pictures, any questions feel free to ask. Planet of the Apes. 8 inch action figures fully poseable. The Zira action figure is in mint condition, it has never been removed from the box. The box is in near mint condition as well. Description: Real nice looking General Ursus from the Mego Planet of the Apes line....This piece is a very nice High grade piece...I would rate it a solid C8...Bubble is firmly selaed....great color...comes on the Green Backer card...their is a small barely noticeble pin hole just above the figures right shoulder (on the bubble)...corners of the backer card are nice and rounded...figure is mint inside the bubble...all accessories still in place. The General Himself is in Excellent Condition. See Photos for the condition of the box.